The Zoroastrian faith emerged from a Indo-Iranian religious system dating back to the early 2nd millenium BCE. Its first known mention in recorded history was in Herodotus' The Histories, completed in the middle of the 5th century BCE. In a varity of forms it was the state religion of the Achaemenid Empire founded around 700 BCE in today's Iran. By 500 BCE the Achaemenid Empire was the largest empire that ever existed in the ancient world, in terms of both land area (about 8 million square kilometers) and percentage of world population (about 50 million people, over 44% of the world's population). After the invasion by Alexander the Great in 334 BCE, the empire was broken into the Ptolemaic Kingdom of Egypt and the Seleucid Empire that retained most of the Adhaemenid lands. Zoroastrianism spread as far east as China. The founder was Zarathustra, who the Greeks called Ζωροάστρης or Zoroastres. He described the human condition as the mental struggle between aša (truth, or the divine order) and druj (lie, or chaos). Adherents believe that Ahura Mazda is the one, universal, transcendent, supreme god. Individuals should actively participate in good deeds to ensure happiness and reduce chaos. The basic tenets are Humata, Hukhta, Huvarshta, or Good Thoughts, Good Words, Good Deeds. Ahura Mazda will eventually prevail over the evil Angra Mainyu (or Ahriman, the Destructive Principal) and the universe will undergo a cosmic renovation (or frashokereti) and time will end. All of creation, including the souls of the dead, will be reunited in Ahura Mazda. Water and fire are the agents of ritual purity. Ceremonies based around water and fire form the ritual life. Water, called aban or āpas, is treated with reverence. As we see below, there are rituals and regulations involving water's proper use. The Yasna service is the principal Zoroastrian act of worship, it culminates in the Ab-Zohr rite that makes a symbolic offering to the waters in order to purify them. The haoma plant was used, pressed during the preliminary rites between sunrise and noon using three small haoma twigs, consecrated water, and twigs and leaves from a pomegranate tree. The second pressing also includes milk. During the Ab-Zohr rite the residue of the pressing is placed in the fire and some of the liquid is poured into the water, the rest is offered to participants and poured onto the roots of fruit-bearing trees. Highly conservative Zoroastrians of Yazd province in central Iran use the Ephedra sinica plant, which is possibly the Soma of early Indo-Iranian religious tradition. The Faravahar or Fravahr is a winged disc religious-cultural symbol of ancient Persia and the Zoroastrian faith. it was adapted by the Pahlavi dynasty to represent the Iranian nature. The winged disc of the sun comes from Bronze Age royal seals in both Mesopotamia and Egypt. It was thought to have represented the "Divine Royal Glory", the Khvarenah or Fravashi of the king, the divine mandate establishing the king's authority. In Neo-Assyrian times the feather-robed archer symbolizing Ashur was added. Currently the figure is interpreted as representing a Fravashi, approximately a guardian angel. 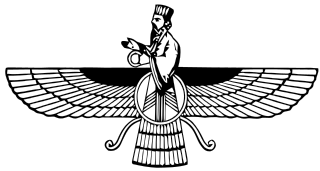 Today in Zoroastrianism, the overall symbol is a reminder of one's purpose in life, living in a way that the soul progresses toward frasho-kereti, union with Ahura Mazda, the supreme divinity. As its name implies the Sad Dar is a treatise on "a hundred subjects" connected with the Zoroastrian religion. The word dar, literally "door, or gate," being also applied to the chapters of a book, and to the "matters, or subjects," of which it treats. This work is not a Pahlavi text, being written in Persian with an admixture of about four per cent of Arabic words; it is, however, more quoted than any other work by the Parsi compilers of the Persian Rivayats, or religious "traditions," in the seventeenth century. In one of its recensions it is also found written in Avesta characters, and the Avesta-Persian sentences alternate with an old Gujarati translation, in imitation of the Pazand-Sanskrit versions of Pahlavi texts compiled by Neryosang. In consideration of the existence of this pseudo-Pazand recension, together with the general acceptance of the work as an important authority, and its being a convenient summary of many of the religious customs handed down by Pahlavi writers, this work may be offered as a suitable appendix to the true Pahlavi texts, connecting them with the Persian writings that are too modern to be accepted as authorities in religious matters. It may ... be concluded that the prose Sad Dar had the reputation of being a very old work in the early part of the sixteenth century. The 56th chapter specifies that you must squat to urinate and keep the urine between your feet. Aim carefully! 1. The fifty-sixth subject is this, that, when any one wishes to make an evacuation of water, it is necessary that he should not make the evacuation of water while standing on his feet. 2. Because, in the commentary of the Vendidâd, it is said, concerning that, that it is a serious sin. 3. When they squat for evacuating water it is necessary that the evacuation of water extend only from the heel as far as the end of the toes; for, if it be more, every drop is a Tanâvar sin. 4. And, when they wish to squat for the evacuation of water, they are to utter one Yathâ-ahû-vairyô; and, when the action is over, they are to recite the Ashem-vohû three times, the Humatanãm twice, the Hukhshathrôtemâi three times, the Yathâ-ahû-vairyô four times, and the Ahunem-vairîm to the end. 5. Because, every time that they act like this, they are pleasant in the eyes and hearts of mankind, and their words are more approved in the vicinity of kings. Other chapters relate to other details of bodily functions, hygiene, and sanitation. The 7th chapter specifies prayers to be said after sneezes. 1. The seventh subject is this, that, when a sneeze ('hatsat) comes forth from any one, it is requisite to recite one Yathâ-ahû-vairyô and one Ashem-û. 2. Because there is a fiend in our bodies, and she is an adversary who is connected with mankind, and strives so that she may make misfortune ('hillat) and sickness predominant (mustaûli) over mankind. 3. And in our bodies there is a fire which they call a disposition —- in Arabic they say tabi'hat —- and they call it the sneezing instinct (gharizi). 4. It is connected with that fiend, and they wage warfare, and it keeps her away from the body of man. 5. Then, as the fire becomes successful over that fiend, and puts her to flight (hazimat), a sneeze comes because that fiend comes out. 6. Afterwards, because it is necessary, they recite these inward prayers and perform the benediction (âfrin) of the fire, so that it may remain for a long period while thou art keeping this fiend defeated. 7. When another person hears the sneeze, it is likewise requisite for him to utter; the said prayers, and to accomplish the benediction of that spirit. The 14th chapter specifies what to do with your nail clippings. Unexpectedly, we are warned that we should keep them away from wizards and that the owls will eat them. 1. The fourteenth subject is this, that, when the nails are pared according to custom (ba-'hilâl), it is necessary that they put the parings into a paper. 2. And it is further necessary to take the Srôsh-bâj inwardly, and to utter three Yathâ-ahû-vairyô. 3. And for the speaking of this — to say with each Yathâ-ahû-vairyô the Avesta is this: — Paiti tú, meregha Ashô-zushta! imau srvau vaêdhayêmi, imau srvau âwaêdhayêmi; imause tú srvau, meregha Ashô-zushta! hyâre arshtayasca, karetayasca, thanvareca, ishavasca erezifyô-parena, asnaca fradakhshanya paiti daêvô-Mâzainyãn; ashâ vohû mananghâ yâ sruyê pare magaonô. 4. Afterwards, one completes the Bâj in the manner that it was taken inwardly. 5. At those two Yathâ-ahû-vairyô, with which one completes the Bâz, at each one, he makes lines ('hatthâ) in a little dust in the midst of the nail-parings. 6. And, if he does not know this Bâz, on uttering the Srôsh-bâj and those three Yathâ-ahû-vairyô he is to furrow three lines, with the nail-cutter, around the nail-parings, and then he is to complete the Bâz with those Yathâ-ahû-vairyô, and to put the dust, with the end of the nail-cutter, into the midst of the nail-parings, and carry them to a desert spot. 7. It is necessary that he should carry a hole down through four finger-breadths of earth, and, having placed the nail-parings in that spot, he puts the soil overhead. 8. For Hôrmazd, the good and propitious, has created a bird which they call Ashô-zusht, and they call it the bird of Vohuman. 9. They also call it the owl, and it eats nails. 10. It is altogether necessary that they do not leave them unbroken, for they would come into use as weapons (silâ'h) of wizards. 11. And they have also said that, if they fall in the midst of food, there is danger of pulmonary consumption. The 30th chapter says you must neither pour away nor drink water at night. 1. The thirtieth subject is this, that it is not proper to pour away water at night, especially from the northern side (gânib) which would be the worst. 2. Therefore, if it become a necessity in the end (ba-'hatam), it is requisite to recite one Yathâ-ahû-vairyô, and, when they make a light ready ('hâzir), to pour away the water gently. 3. In like manner it is not proper to swallow water at night, because it is a sin. 4. But, if a necessity arises, it is necessary to make a light ready, and one first eats some morsels of food (ta'hâm) so that the sin may be less. The 35th chapter explains how to wash the face, being careful not get water in your mouth while doing so. 1. The thirty-fifth subject is this, that, when they wish to wash the face, they should recite one Ashem-û, and set the mouth firmly closed, so that the water, not staying away from it, shall not go into the mouth. 2. And, as one washes over the face, they should recite the Kem-na-mazdâ, so that the fiend Nasrusht may become smitten. The 50th chapter explains the ceremonial morning ablution, where you first use fruit or dry grass to clean your hands, face, nose, eyes, and feet, and then to use water. Still being careful not to allow any water to enter your mouth. 1. The fiftieth subject is this, that, every day at dawn, when they rise up from sleep, it is not proper to wash the hands first with water. 2. The ceremonial ablution is to wash the hands, face, nose, eyes, and feet thoroughly, either with fruit (mivah) or some grass upon which no water has come; afterwards, to make them dry, and to wash them three times with water in such a manner that it becomes wet from the face as far as the ear. 3. It is necessary to keep the mouth closed, so that the water shall not go into the mouth; for if a drop, owing to not stopping, goes into the mouth, it is a sin of three hundred stirs. 4. Afterwards, one is to wash the hands three times with water, as far as the upper arms; first the right hand, and afterwards the left hand; and, in like manner, he is to wash the right foot and left foot. 5. Then they recite the Kem-nâ-mazdâ, for, every time that they wish to recite anything as an inward prayer, it is necessary that the hands be washed with ceremonial ablution, and, if they are not, the Avesta is not accepted, and the fiend of corruption (nasa) does not rush away, and it becomes a Tanâvar sin. The 74th chapter revisits morning washing. This one specifies consecrated bull's urine for the first washing. 2. Afterwards, they are to wash the hands quite clean with water, in such manner that they are to wash the hands three times from the forearm (sâ'hid) to the end of the hand; and the face is washed from behind the ears to below the chin and up to the crown of the head; and one washes the feet three times thoroughly, as far as the leg (sâq); then one recites the Kem-nâ-mazdâ. 3. If it be a place where there is no water, and the risk be that the time for the Niyâyesh should pass by, it is requisite to cleanse the face and the hands three times with dust, and to perform the Niyâyesh. 4. Afterwards, when one arrives at water, he is to wash the hands and face a second time, and to accomplish the Niyâyesh. 5. Before the time when one throws something on the hands it is not proper to wash the hands and face, and it is a Tanâvar sin; it is also not possible to work at anything whatever with the hands and face not washed. * The long-metre version of the Sad Dar specifies that the ritualistic liquid is Nîrang, consecrated bull's urine. The 75th chapter addresses public health issues of water purity for irrigation. 1. The seventy-fifth subject is this, that, when they wish to provide a supply of water for any cultivated land, it is first necessary that they make an inspection through every course and channel of the water, to ascertain whether there be dead matter therein or not; and, after that, through the water in like manner. 2. If they be in the middle of it, when the water is within their cultivated land, and dead matter comes into sight, if it be possible to ward it off one wards it off, and if it be possible to divert the water one diverts it. 3. And if the water arrives with dead matter unawares, it is no sin for them. 4. But if no inspection of the stream and cultivated land be made, and the water arrives with dead matter, these people are polluted, and it is necessary to perform the Bareshnûm ceremony as regards their heads. The 86th chapter has to do with beavers, or possibly otters, all of which live in and around water, and hedgehogs. Zoroastrianism has much reverence for life, including animals. 1. The eighty-sixth subject is this, that it is not proper to kill a beaver*; but, if they see it in any place, it is necessary to take it up and carry it to running water. 2. For, in the commentary of the Vendidâd it is ranked as a great sin for the killer; and, as to every one who kills a beaver, the source of his seed becomes exhausted. * literally: "water dog", some English translations refer to otters instead of beavers. 1. The fifty-seventh subject is this, that it is not proper to kill a hedgehog; and, everywhere that they see it, it is necessary to take it up and carry it into the wilderness (sa'hrâ), so that it may go into a hole, which is ever considered a great good work. 2. Because, when a hedgehog is in their nest, some ants will die; it will also catch and eat thousands of snakes and other harmful creatures, and it eats all noxious creatures. 3. Therefore, owing to the whole of this, these words are expedient.